Bishop Brian preaching at St John’s Selkirk. On Saturday Jane and I drove down to Selkirk — via Kirkcaldy to pick up a pram, via South Queensferry to have lunch with my brother, via Hermiston Gait (Edinburgh) to buy winter supplies for the car, and via Gilmerton (Edinburgh) to help set up Jane’s sister’s new broadband connection — to visit my Mum, sister and nephew. 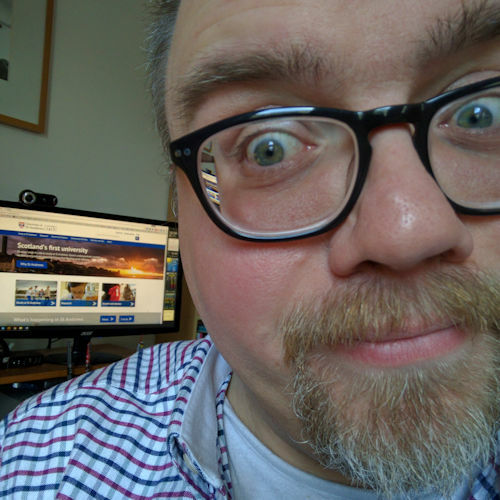 The reason for going, other than simply because I love my Mum and it had been too long since I’d been to visit, was that Mum was one of seven being commissioned by Bishop Brian as part of a Ministry Leadership Team at the Church of St John the Evangelist, Selkirk. 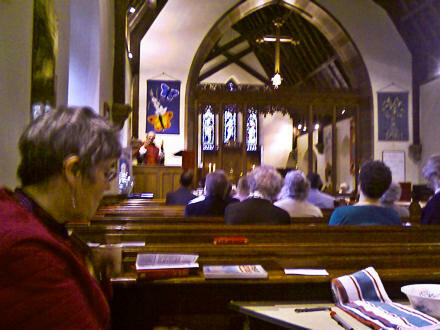 It was a lovely service, lovely to be back in St John’s (who encouraged and sponsored my own ministry) amongst friends. Bishop Brian preached a great sermon about the need to share in ministry rather than share out ministry. It was encouraging, insightful and realistic. One thing he said, which stuck with me (if I remember it correctly) was that these seven people were not being commissioned to wow! with their competence but to be obedient servants and just get stuck in and do what they could. Then minutes after the comment about not wowing with competence Bishop Brian stepped out of the pulpit, knocked over a banner which tumbled onto the window ledge upsetting a flower display. It was a genuinely beautiful moment of humanness, which was received by the congregation and reflected as a warm and delighted laugh. Brian, one of the seven to be soon commissioned, leapt to the Bishop’s aid and between them they re-set everything as it had been. “There’s collaborative ministry in action”, David, the Priest-in-Charge affirmed. 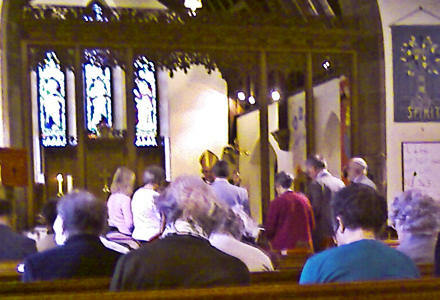 Bishop Brian (in the pointy gold hat) commissioning the Ministry Team at St John’s Selkirk; Mum is in the bright pink top. and of your fellow men and women? to fulfil their baptismal calling to ministry in this place. who came not to be served but to serve? I was so proud of Mum, who has been such a role model and encouragement in my own journey of ministry. It was a joy, delight and privilege to be there. It was lovely to share that too in the company of Jane, who had only had two hours sleep the night before. It occurred to me that “Where two or three are gathered together…” could easily describe Jane just now! After the service, after the coffee, many of the congregation retired to the church hall for a buffet (my brother as a child called these a ‘pick and eat’), which was served by our newly commissioned team, ably demonstrating their servant natures.